Yesterday we went to Whiteleys to see two films, and spent the whole afternoon and evening in the area. It's soooo tiring seeing two films in a row - at first I was deciding between X-men First Class and Transformers Dark of the Moon, but was told (by several people) that Transformers is a bit boring... @_@ and I thought it'd be an overload to see two similar films on the same day! 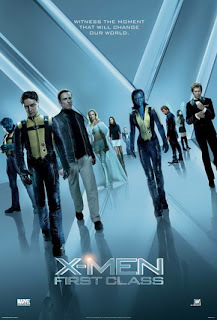 X-men First Class is the prequel of the X-men trilogy, and is basically about how Charles Xavier and Magneto come to recruit their members in the early days. I quite like this film - to be honest I find them all very similar, but it's entertaining and gripping enough. The one 'message' that stands out to me is how you have to accept yourself no matter how different you are, stay true to and be proud of whatever you are, and fight against those who try to oppress or discriminate you. This is a very commonly held belief, especially in the Western world, and of course it has its reasons, as people all want to be unique and different from others, but it's really easier said than done in reality, and sometimes I think some people push the boundaries too much and become too aggressive and defensive about their 'difference'! Firstly, Roberts' character Ms Tainot's totally unlikeable - she doesn't have any passion towards her job and all she does in the community college classroom is to give students random topics to present on and frown upon them. 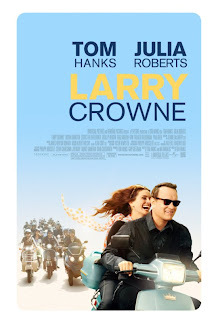 She makes every effort to try to dismiss a class by saying there are too few people in the classroom, and yet you find Larry Crowne (Hanks) and other students in her classroom falling in love (Crowne, literally) with her and enjoying themselves so much. Don't forget they only go to community college, they're not your Ivy-league students. And throughout the film you see Crowne befriending this young student Talia and his friends instead of swooning over Tainot, so where exactly is the romance? Don't tell me it's that night Tainot's drunk - nothing happened! I found myself totally unconvinced that Tainot's loveable and Crowne's in love with her. There's nothing in the film that suggests Crowne's in love with her - and yet he is, apparently. So strange. S said it's possible that something got cut out of the film, but I find it hard to accept too - I mean, in a big-budget (two big names) film like this, would they allow the post-production to ruin the whole thing? I don't think so! Anyway, I was just unlucky to have chosen this one...should have gone for the older Bad Teacher - it's probably better! Watched quite some trailers in the cinema...I'm looking forward to One Day (who isn't? Really should start reading that damn book that's been collecting dust! ), The Skin I Live In (Almodovar, need I say more? ), and one other film that I missed the title of (coz I was playing with my phone...)!